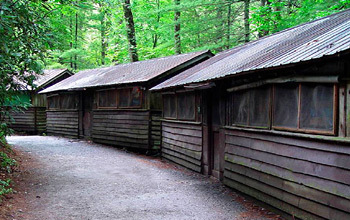 You will live in simple open air cabins with 8 to 10 campers who have completed the same grade as you. There are two counselors per all girl camp cabin group. Girls are divided into three age groups, or lines at Rockbrook. Each line consists of 5-9 cabins. A bathhouse is centrally located on each line. We have traditional stone lodges for each age group of girls. 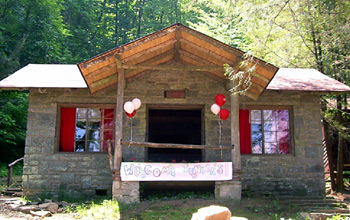 They become each line’s home for all girl camp evening programs and other group activities. Here’s a short video on the lines at Rockbrook. Take a look to see how different age groups are divided and learn about the progressions and leadership program for girls at camp. We have three age groups, which we call “Lines.” “Juniors” are girls who have just completed anywhere from kindergarten through fourth grade, “Middlers” are having just finished fifth or sixth grade and “Seniors” have just completed seventh, eighth, or ninth grade. The reason we split them up is we’ve found that those are ages that really work well together. They’re most alike in their interests and the challenges that they need are most similar. So the type of activities Juniors want to do when they are at camp are very similar – they are very focused on in-camp activities. They really love to spend their time right here in the middle of camp doing all of the different offerings. 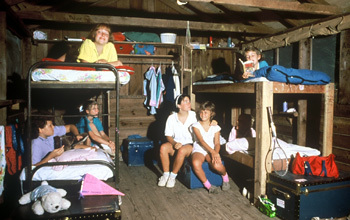 They do have an opportunity, all camp girls do have a camp out and so even the Juniors will have their camp out because we have our outpost camp here in the camp property. The Middlers, the fifth graders, that’s an age when they really want to start exploring, and they really want to start going on some of the trips out of the camp property. We have trips to Pisgah National Forest, the Dupont State Forest, and then to the Nantahala River. And then seventh, eighth and ninth graders that’s when there is some really different interests at that age too. You get pretty close to these girls. You live in cabin groups with them and all your activities are divided by age group as well and so your skill level is based on that age group and once you get older, you’ll progress to a different levels. Most evenings, the girls have activities just with their age group, so a typical evening program is getting together in their lodge for skits or games, but once in a while, maybe every two or three times a week, we will have a special event that will involve the whole camp. So, it might be something like “Birthday Night,” “Granny Bingo,” an auction. We do know that some of these work better with different ages than others, so there are times when we might have two going on at same time and younger kids would be more drawn to one and older kids to another, but we kind of offer them both so that they can have an opportunity out two different things. For instance, on Granny Bingo, we might also have an alternative hike for our Senior campers. So as the girls get older, we start to put more responsibilities on the girls. For example, the girls going into tenth grade, they are our CAs and they have this big banquet at the end of the year that they work on the entire session and the theme is a secret and no one knows until the end of the year, and that’s part of their responsibility that year. Before you even get to camp, you are assigned a pen-pal, and so we are starting to encourage friendships and the bonding before you even come, so that when you get here you feel instantly like that you have a peer because that’s sort of a touchdown of what camp is for girls. The things I hear them say at the end of the summer is, “I made the best friend I’ve ever made and I got to be myself.” As you grow through the years at camp, they bond even more, so we really work with them in leadership of camp to help these girls have an incentive to come back and see what, as a group, the power that they have as a group of young women. The daily camp schedule balances plenty of busy fun and free time for each girl to just be at camp with her friends. 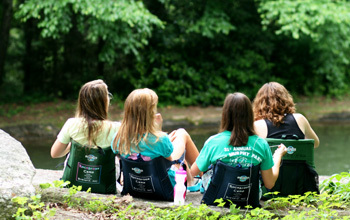 For scheduled activities, campers select their own set of four after arriving at camp. On Sundays, we change the schedule a bit, enjoy sleeping in and eating breakfast in our pajamas! 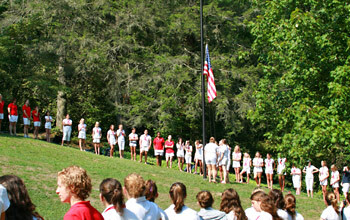 Then we change into our “whities” (camp uniform) for flag raising and chapel. Chapel is an ecumenical time of reflection led by campers and has themes such as friendship, making memories, nature, and trust. Sunday afternoons we have all-camp activities, camp-wide games and other Rockbrook surprises.